This animation of NOAA’s GOES satellite data shows the progression of the major winter storm in the U.S. south from Feb. 10 at 1815 UTC/1:15 p.m. EST to Feb. 12 to 1845 UTC/1:45 p.m. EST. 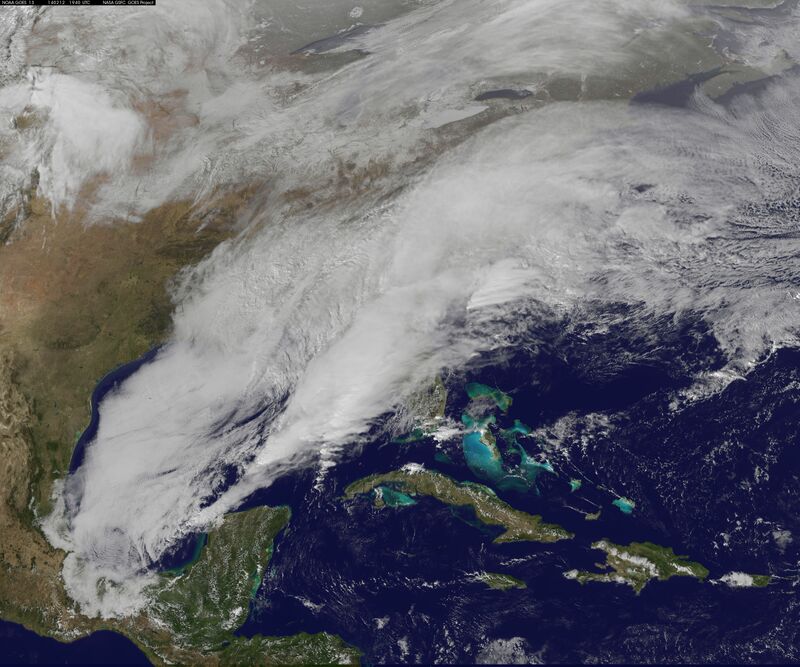 A new NASA video of NOAA’s GOES satellite imagery shows three days of movement of the massive winter storm that stretches from the southern U.S. to the northeast. Visible and infrared imagery from NOAA’s GOES-East or GOES-13 satellite from Feb. 10 at 1815 UTC/1:15 p.m. EST to Feb. 12 to 1845 UTC/1:45 p.m. EST were compiled into a video made by NASA/NOAA’s GOES Project at NASA’s Goddard Space Flight Center in Greenbelt, Md. In the video, viewers can see the development and movement of the clouds associated with the progression of the frontal system and related low pressure areas that make up the massive storm. The video also shows the snow covered ground over the Great Lakes region and Ohio Valley that stretches to northern New England. The clouds and fallen snow data from NOAA’s GOES-East satellite were overlaid on a true-color image of land and ocean created by data from the Moderate Resolution Imaging Spectroradiometer or MODIS instrument that flies aboard NASA’s Aqua and Terra satellites. On February 12 at 10 a.m. EST, NOAA’s National Weather Service or NWS continued to issue watches and warnings from Texas to New England. Specifically, NWS cited Winter Storm Warnings and Winter Weather Advisories were in effect from eastern Texas eastward across the interior section of southeastern U.S. states and across much of the eastern seaboard including the Appalachians. Winter storm watches are in effect for portions of northern New England as well as along the western slopes of northern and central Appalachians. For updates on local forecasts, watches and warnings, visit NOAA’s www.weather.govwebpage. This visible image of the winter storm over the U.S. south and East Coast was taken by NOAA’s GOES-13 satellite on Feb. 12 at 1855 UTC/1:55 p.m. EST. Snow covered ground can be seen over the Great Lakes region and Ohio Valley. NOAA’s Weather Prediction Center or WPC noted the storm is expected to bring “freezing rain spreading into the Carolinas, significant snow accumulations are expected in the interior Mid-Atlantic states tonight into Thursday and ice storm warnings and freezing rain advisories are in effect across much of central Georgia.